There is nothing like the smell of bacon in the morning. The hickory smoked aroma rallies up the kiddos pretty quickly, especially when there is a promise of a stack of golden pancakes or a pan of beautifully scrambled eggs. On the slim chance of leftovers, bacon mostly goes with everything; it is the classic pearl earrings of the food world and a staple in many households. Its notoriety as a favorite food can be found on t-shirts, coffee mugs, and billboards across the USA, in other words, Bacon Rules. But oh, my jolly jumping jelly beans, it is a real mess maker in the kitchen. That is why I am sharing an easy way to bake bacon in the oven. 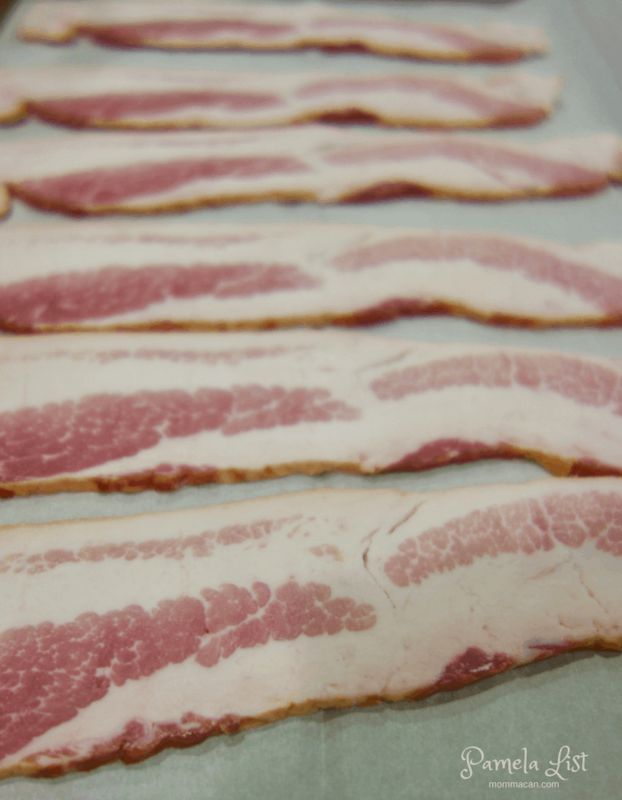 Question: What recipes do you use for leftover bacon? I am always looking for fresh ideas! 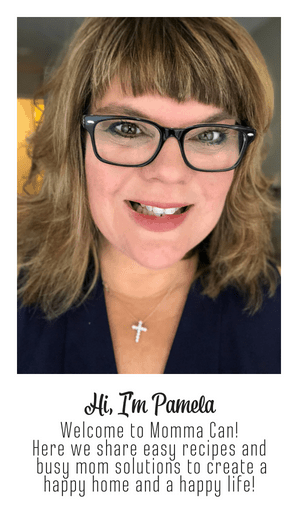 Wow Pam – thank you for this info – very helpful. Sailor loves bacon for Sunday morning breakfast, so I buy and microwave the pre-cooked bacon. But this is a great option when & where time allows! Bacon recipes..?..I just stumbled across one for brussel sprouts! I will let you know how it turns out! 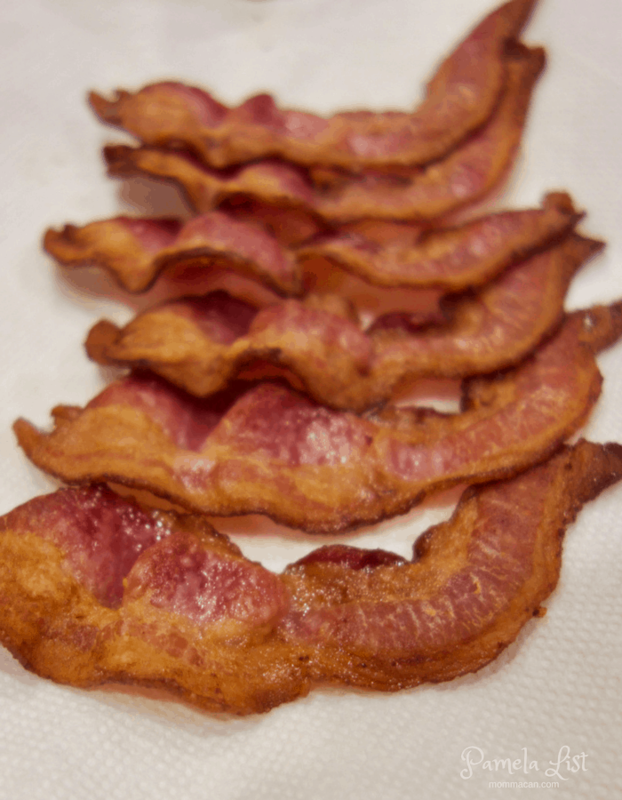 Pam I always cook bacon in the oven and I add a secret ingredient….sugar free syrup and pepper. I got my inspiration from Paula Deen who taught me to use real syrup, but considering she is now a diabetic, she probably does what I do now. LOVE that oven baked bacon! Ahh, I love the smell of bacon. This way seems like it will be healthier. I must give it a try. I just did bacon in the oven for the first time about 2 months ago. It was a total success except for the fact that the recipe said it would be done in something like 10 minutes- it wasn’t! My hubby decided to replicate this about a month later except he forgot one crucial step. A couple of my cookie sheets don’t have edges the whole way around so when I did the bacon, I created a fake edge with tin foil. Well, he didn’t do this (and it was the day after I cleaned the oven). I thought it wouldn’t be a big deal, but the next time I turned on the oven I about killed myself and the dogs with the toxic smoke. Anyway, it was back to cleaning the oven again!! As far as what I do with left-over bacon? I crumble it and put it over brussel sprouts that have been tossed in olive oil and then bake it all together until he brussel sprouts caramelize- it is so yummy!!! Baking bacon in the oven is life-changing…if that’s not too dramatic. I love not smelling like bacon frying anymore since I discovered you could do this too while ago. Thanks for sharing this great tip with others at Family Joy Blog Linkup. I would never have thought to bake bacon in the oven! Bacon in the oven is the best! No mess! I was wondering if there is much of a difference between baking it with parchment paper or the silicon baking sheets? I usually use the silicon baking sheets, but I was wondering if parchment gives it a better crunch? Thanks so much!